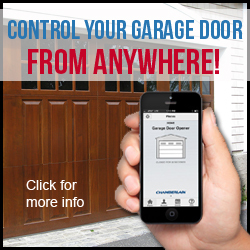 Control your garage door from your smartphone! MyQ smartphone garage door openers offer unmatched convenience and security to your home, family and belongings. Thanks to an ingenious solution, the MyQ Garage doesn’t require any changes be made to your existing garage door setup. Opening and closing the garage door is so much a part of your daily routine that it is hard to remember if it was closed. That’s why Chamberlain developed a solution to put peace of mind in the palm of your hand — The Chamberlain MyQ Garage™ Smartphone Garage Door Controller. The MyQ Garage allows you to control and monitor your garage door from anywhere, at any time. Regardless of manufacturer, the MyQ Garage works with the majority of garage door openers manufactured after 1993. Montauk, Southampton, East Hampton, Hampton Bays, Westhampton Beach, East Quogue, East Port, North Shore, Manhasset, Oyster Bay, Syosset, North Port, Bayville, Port Washington and more.